Lama Zopa Rinpoche and Ven. Thubten Sangpo releasing balloons with mantras and prayers written on them to bless the environment and all sentient beings. Amitabha Pure Land, Washington, USA, August 2008. 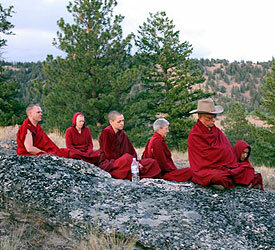 Wearing the cowboy hat He had been offered the day before, Rinpoche led an impromptu meditation on emptiness at Amitabha Pure Land, Washington, USA, August 2008. Rinpoche sent this advice to a center which had just been burgled. “So many times we make prayers to receive the suffering of others and to be free of all obstacles, now we can think how fortunate we are that our prayers have been answered. Obstacles have ripened in the form of them breaking in, stealing money, etc., so now we have had small success with our prayers. Rinpoche recently translated a text giving the results of cutting one’s hair on various days, which applies to ordained and lay people alike. Bringing the total number of FPMT centers, study groups, projects and services worldwide to 151! In line with our primary mission of service, the Education Department is officially changing its title to FPMT Education Services while our publications will now say FPMT Education Publications. 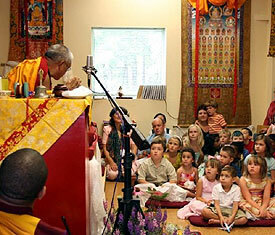 Children’s event at Kadampa Center, USA, July 2008.
done well in their exams on the first section of Bodhisattva Deeds, Tenets will provide students with some background for the challenging 9th chapter. Nalanda’s BP is offered in English, French and Spanish, and it is a wonderful opportunity to study this program full-time in a monastic environment! New students are welcome for each subject! Our new Coordinator for French BP Materials will be Ven. Ngeunga, who is already part of the French Translation Office. In this new role Ven. Ngeunga will focus on gathering French BP materials and preparing them for distribution on the BP web update page. To enable French BP students to collect their three month lam-rim retreat commitment, after Institut Vajra Yogini offered a month lam-rim retreat last winter, the tradition is continued by Kalachakra Centre who will offer a month lam-rim retreat in their new retreat center in January 2009! Spain is also going strong, with the first round of BP near completion at Nagarjuna Barcelona (and a second round already in full swing! ), Valencia in the second year of a productive BP, and Madrid having completed the first exam in June this year. Now we need a coordinator for Spanish BP materials. The BP at Chenrezig Institute in Australia has started preparations for the second impressive Lam-rim Chenmo teaching that will begin in 2009! As we mentioned last month, Rinpoche has appointed members to the new FPMT Translation and Editorial Committee. Ven. Fedor Stracke, Ven. Joan Nicell, Ven. Namdak, Conni Kraus, and Jon Landaw will be heading up the efforts to establish an FPMT glossary of terms and style guide that will be used for all FPMT program translations. As a great boost to getting this work underway, Ven. Joan will be attending a distinguished translation conference sponsored by Khyentse Foundation in India next March. Painting mantras on the bird feeder to bless the birds at Amitabha Pure Land, Washington, USA, August 2008. All those offering service in the FPMT mandala as center/project director, resident and touring teachers, spiritual program coordinator, board member, study group and regional and national coordinators are invited and strongly encouraged to attend – more information available in the FPMT Affiliates Area! Rinpoche has given new advice for the prayers to be recited before teaching occasions and has advised us to make this into a small booklet for center gompas that can be taken away by students if they would like. Please download the updated Prayers for Teaching Occasions. Reminding all centers, study groups, projects and services that the new FPMT brochure is available. This brochure will help place your activities in the amazingly positive and inspiring context of the worldwide FPMT mandala. It will be helpful as a way to connect people to Lama Zopa Rinpoche and the FPMT. We encourage you to make it available to visitors, students, center/project board members – anyone who you want to help understand that your activity is a part of a fantastic organization. Inner Job Description training: A very successful two day training was held at Vajrayana Center, Australia led by Ven. Chokyi and Allys Andrews. In November, Amy Cayton will lead an IJD training at the North American regional meeting in Portland and Allys Andrews will lead at the Australian national meeting. These are great opportunities for centers to send candidates to cultivate as future trainers. See a full list of trainings. Harald Weichhart will be offering software training in France and Germany in October with an emphasis on helping our translation offices in these countries become fully versed in the design and layout programs used by Education Services. France and Germany will soon be printing Essential Buddhist Prayers, an FPMT Prayer Book Volumes 1 & 2 in the same format as the English. 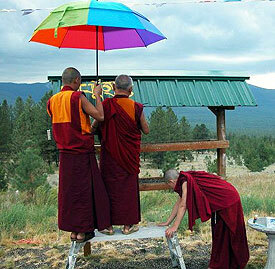 With luck, the Spanish and Italian will also be done in time for Rinpoche’s European retreat in May 2009. Harald is also helping us to get French, Spanish, German and Italian subtitles on the Discovering Buddhism DVDs. 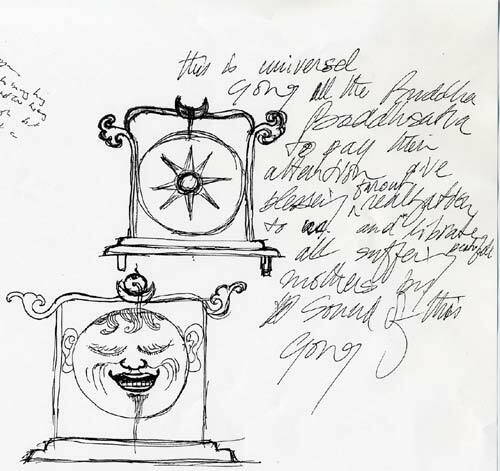 Lama Zopa Rinpoche carving mantras on stone and the completed carving. Amitabha Pure Land, Washington, USA, August 2008. This year Jamyang Buddhist Centre, London, UK is celebrating its 30th anniversary, Maitreya Institute, Amsterdam, Netherlands is celebrating its 10th anniversary and Panchen Losang Chogyen Centre celebrated its 5th anniversary! Congratulations! We rejoice with you at the emergency rescue operation offered by all of our centers! For the second time, the monks of Nalanda Monastery will recite the Sanghata Sutra continuously for 10 days from October 7 – 17. The whole Sutra recitation will be broadcast live via webcam 24 hours a day for all who view the event to receive the blessings of this Sutra. Once they’ve started, the recitation can be seen live anywhere in the world at Sanghata Sutra Marathon. FPMT would like to thank everyone for their heart felt and compassionate support of the 2008 Sera Je Food Fund campaign. From April 29 through June 30, over $165,000USD was raised. This included generous donations by individuals as well as centers. On May 14, FPMT sent $118,000USD to Sera Je Monastic University to cover the expenses of offering food to the 2,700 monks in residence for 6 months. Please rejoice in this virtuous merit. Thank you again! Shen Phen Thubten Choeling Study Group meets at Elaine Brook’s house in the Golden Valley in England. It recently had an energy audit, done by the “Superhomes Network”, an organization that arranges visits to eco-homes for people who want to learn more and change their own homes in order to prevent climate change. The audit showed that the house used less than 40% of the energy than is average for this size of house. This was achieved by the use of extra insulation, energy efficient light bulbs, solar hot water and solar electricity, and using hedge and fruit tree prunings as fuel. What also makes a big reduction is avoiding waste, because lights and appliances are switched off when not in use, and woolly sweaters take the place of turning the heating on full in the winter – this last one makes the biggest difference and is also much healthier as it reduces dust and dust mites. So the house is now an official “Superhome” and will be open for visits from those interested in learning what works and what doesn’t in the search for the ultimate “carbon neutral house”. Keep checking fpmt.org/jobs.html for interesting opportunities to offer service in FPMT centers around the world. Opportunities include House Manager and Volunteer Coordinator at Mahamudra Centre, New Zealand and Vajrapani Institute in California, USA is looking for a caretaker.